Storyline from IMDB: With their daughter away, her parents decide to skip Christmas altogether until she decides to come home, causing an uproar when they have to celebrate the holidays at the last minute. This film is based on John Grishams Skipping Christmas, which I read earlier during this Christmas Challenge. I was not too fond of the book, but I must say that I love the movie. Tim Allen and Jamie Lee Curtis are wonderful as Luther & Nora Krank. The movie is funny (I’ve watched it 3 times now) and I highly recommend it. This is a part of my Christmas Spirit Reading Challenge – Fa La La La level. First of all I wanna say that I was very surprised to learn that John Grisham has written a Christmas novel! Who would have thought? I give the novel ♥ ♥, which means I find it okay. It was a nice Christmas read and I thought it was quite amusing at times, but the problem for me was … I had already seen the movie and it’s the wrong order for me! I easily get to read the book too fast when I know how it’s gonna end and that’s not fair to the book or the author. My mistake! This was my 1st book in the Christmas Spirit Reading Challenge 2012. Click here to read more about Skipping Christmas on Goodreads. Help me with my Christmas reading challenge! 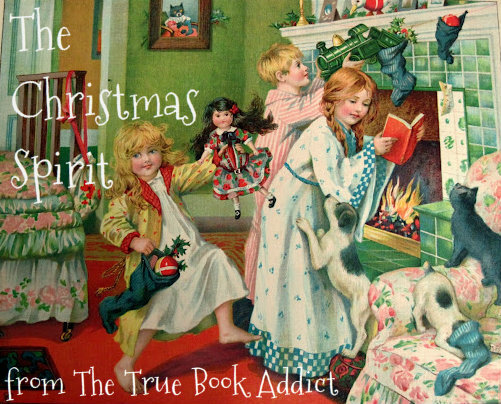 Michelle (The True Book Addict) has invited me to her Christmas reading challenge. I think it’s a great event, that can get us into the Christmas spirit and for sure make me read books, I’ve never even considered before. You can join the event as well and you do not have to have a blog to participate. Michelle hasn’t set up a lot of rules; the most important is to have fun and if you read only 1 Christmas book, you can still participate. Visit Michelles blog for more information and to sign up … 2012 Christmas Spirit Reading Challenge! On Goodreads I’ve found so many interesting Christmas reads, but apparently they haven’t been published in Denmark. Besides some of the fairytales written by H. C. Andersen, I’ve only been able to find John Grishams Skipping Christmas with the Danish title Hjælp, det er jul. Does any of my readers from Denmark know any Christmas books?